Christmas at Sauer Beckman Farm. The holiday season is a special time to visit your state parks. Parks throughout Texas offer festive activities that could cause even old Scrooge, himself, to crack a smile. Check out the calendar section of the Texas Parks and Wildlife website for a complete listing of holiday events in parks. Until you do, here are a few of our favorites for your consideration. December seventh, join rangers and visitors at Tyler State Park for a stroll around the lake as the sun goes down… and enjoy the sights, sounds, and smells of winter. 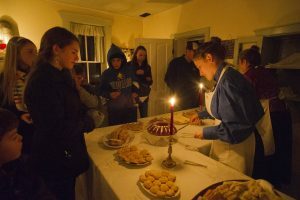 December eight, Fort Richardson SP & HS—a half hour south of Jacksboro—invites visitors to observe ‘ghosts’ of cavalry soldiers and their families as they celebrate Christmas in an 1870’s U.S military post. On the 12th through the 15th of December, Daingerfield SP in Daingerfield invites visitors to drive through the park, which will be lit up like Santa Land and meet Santa himself on Friday and Saturday! And, on December sixteenth, head over to Johnson City for the 49th Annual tree lighting at LBJ State Park and Historic Site. Join the Texas Hill Country Community in this special tradition started 49 years ago by President and Mrs. Johnson. Find more holiday events at state parks in the calendar section of the Texas Parks and Wildlife website. You are currently browsing the Passport to Texas weblog archives for the day Wednesday, December 5th, 2018.